Australia started their European tour with an enthralling 40-36 victory over the Barbarians at Twickenham in new coach Michael Cheika's first game in charge. 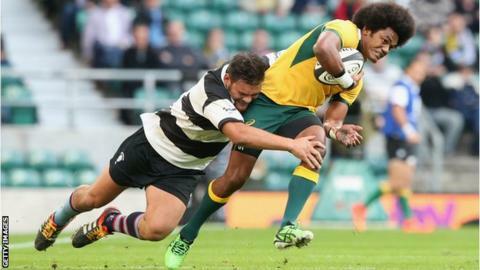 The invitational Barbarians, coached by All Blacks great John Kirwan, produced a late rally but Australia held on. "Our defence stood strong at the end," said Wallabies captain Matt Hodgson. "It is a big step forward for us - we're on a five-week tour and needed to start with good momentum." Cheika took over from Ewen McKenzie following defeat by New Zealand in the Rugby Championship last month. They face Tests against Wales, France, Ireland and England in November. The Wallabies had Will Genia and Quade Cooper back in half-back tandem for the first time in a year, but couldn't control a wide-open game that swung back and forth. Sam Carter, Benn Robinson, Tevita Kuridrani, Rob Horne, Bernard Foley and Sean McMahon ran in six tries - five converted - to put Australia 40-22 ahead with just six minutes to go. But late tries from Nick Cummins and replacement Marnitz Boshoff - both converted by Boshoff - ensured a thrilling finish. Frank Halai, Adam Thomson, and Francis Saili had earlier crossed for the Barbarians, with Colin Slade adding a 45-metre penalty. "In attack and defence we had some good moments and some poor moments, which is exactly what I imagined would happen. All in all it wasn't a bad hit out for us. "After half-time we kicked on and got away from them. Then I think maybe [there was] a bit of fatigue - we've had big training week, and the travel and everything probably kicked in. "When we did good things in the new shape that we are playing we looked relatively good. We've just got to keep doing that. We need to be a bit sharper to the ball in the attacking ruck so we can get some quicker ball. "It has been a bit of the unknown. I've never been here before at this level, so I'll learn along the way as well." "It was an incredible game to finish like that - we were so close. "We showed we were willing to give it all and left absolutely everything on that park. "It was a really enjoyable game to play in - a hard, hard game of international rugby. I'm really proud to pull this jersey on. "We blended well considering we got thrown together on Monday not knowing each other." Replacements: Schwalger (Parson, 50), du Toit (Stevens, 50), Adriaanse (Ta'avao 51), Brussow (Thomson 52), Alemanno, Pretorius (Cubelli 58), Tuculet (de Jongh 59), Boshoff (Slade 69). Replacements: Hanson (Faingaa 55), Slipper (Robinson 54), Kepu (Alexander 60), Skelton (Carter 58), McMahon (Higginbotham 21), White, Foley (Cooper 55), Lealifano (Toomua 65).